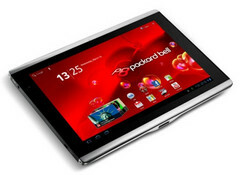 The Acer Iconia Tab A500, although has not got much applaud from the market, that did not prevent the Taiwanese computer giant from rebranding it in Europe as Liberty Tab under its subsidiary brand name called Packard Bell. It has the same 10.1 inch 1280 x 800 pixel display panel, 1 GHz NVIDIA Tegra 2 dual core processor and runs Google Android 3.0 Honeycomb. It has Dolby mobile feature with stereo speakers. The Liberty Tab is expected to hit the European market by June this year.